While I’m on the subject of the Milibands and the past, I’ve been meaning to highlight this image, posted by the Spectator in response to Ed’s conference speech last week. Its message is clear. Ed is socialist. Socialism is associated with the 1970s. 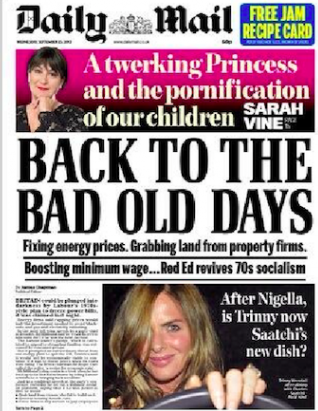 To adopt Ed’s policies would be to go back in time. Of course we can (and very well might) dispute every one of these assertions, but their emotional power derives from our fear of regressing, of going against the natural order of linear time. In particular, it tries to undo the ‘modernisation’ of the Labour Party under Tony Blair. We were left in little doubt that Miliband’s supposed reversion to the policies of the 1970s would not be a retro-cool return to the ‘good old days’. Yesterday, Jonathan Hopkin gave a very thought-provoking speech on ‘Cartel Parties and the Crisis’ at the University of Sussex. At the start he posed the question of why ‘zombie’ neoliberal policies refuse to die, despite the 6-year-old financial crisis and despite the availability of many alternate economic models. My answer to this is not original. It is simply that neoliberalism (like liberalism before it) is intrinsically associated with progress, and that progress has been accepted as an unqualified good. Therefore, to do something different looks far too much like ‘going back’ – especially when all of the alternate models are based on adaptations of Keynesianism, which is not only ‘not new’ but was supposedly ‘discredited’ in, yes, you guessed it, the 1970s. …. the idea was that as a result of the way the country had been governed for the previous years, Britain had gone backwards in its achievements, whereas in the past it had gone forwards. And if we could bring the past into the future, into the present, then we could go forwards ourselves. It was the success of this project which now makes it so difficult to argue that there might be another way to travel forward. But the idea of going backwards to go forwards, may itself be an idea that is worth resurrecting.